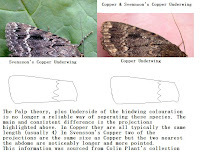 The Palps theory is no longer a reliable key for seperating this species, nor is the underside of the hindwing suffusion, they are both evident in both Males and Females of the species. Here is the correct way of telling these species apart which WT&L does not publish. 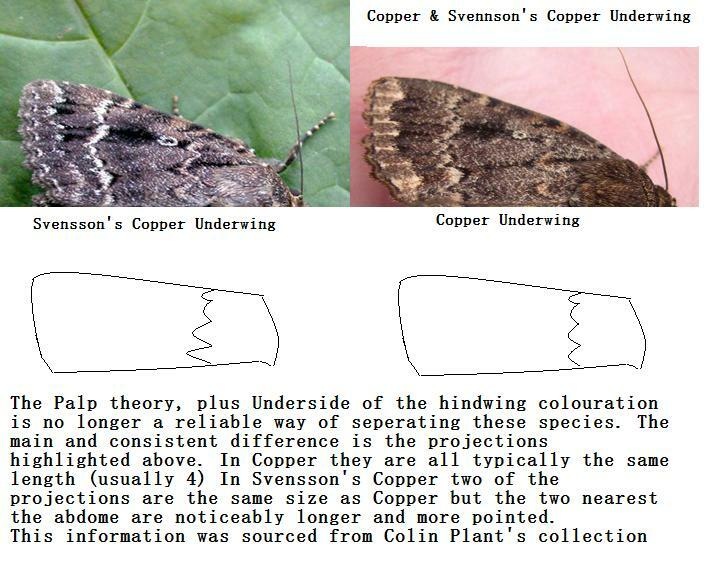 This information was sourced from a book Notuidae of Central Europe in Colin Plant's possession and we have had an afternoon going through his collection and proving this theory correct, this is also a much easier way of diagnosing. Hope this helps and sorry to be a nuisance but but we do all want correct records at the end of the day. Not sure the palps feature was ever claimed to be 100% reliable in isolation. Equally, the projections from the antemedian line has been noted and referenced as another feature that is not 100% reliable back in Skinner 2nd Edition. In fact - seems that all external features may not be 100%. If it weren't for the larval differences I'd say lump them! Seemed 100% consistent with the specimens we had to go on, although a few more specimens could turn out to be 'spanner's in the works' who knows!